Clinic Synopsis: In this session the application of the simple basics for efficient horn playing for all ages will be addressed. Topics will include buzz and blow, song in the head, repertoire and leaving baggage behind, and performing to your optimum level. 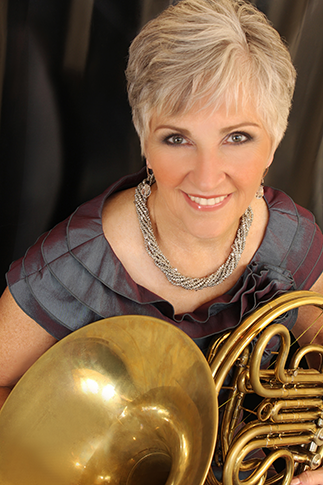 Clinician Biographical Information Gail Williams is an internationally recognized hornist and brass pedagogue. She has presented concerts, master classes, recitals, and lectures throughout North America, as well as in Europe and Asia. After 20 years with the Chicago Symphony Orchestra, Ms. Williams is in demand as a soloist, chamber musician, and recording artist. She is currently Principal Horn of the Grand Teton Music Festival Orchestra and has recently performed on a number of prestigious chamber music series. Gail is one of the founding members of CCME, as well as the Summit Brass. In addition to her eight recordings with Summit Brass, Ms. Williams can be heard on her four solo recordings, two of which are available on Summit Records. Three chamber music CD’s are also available on Summit Records, one with Daniel Perantoni and two with CCME. The recordings feature compositions by Ludwig van Beethoven, Mozart, Brahms and works for Horn Tuba and Piano. A CD of works for horn and percussion by Alec Wilder and Charles Taylor and the Goddess Trilogy for horn and piano by John McCabe is available through Ms. Williams. Ms. Williams has commissioned many works for horn by composers Dana Wilson, Anthony Plog, Douglas Hill, James Stephenson and Augusta Reed Thomas. Her latest solo CD is available on CD Baby, HORN MUSE, featuring commissions of Plog, Wilson, and Hill. Ms. Williams is the horn professor at Northwestern University, where she has been on the faculty since 1989. Her awards included Ithaca College's Young Distinguished Alumni Award and an honorary Doctorate of Music, also from Ithaca College. In May of 2005, Ms. Williams was awarded the Charles Deering McCormick Teaching of Excellence Professor from Northwestern University. In the fall of 2004, Ms. Williams traveled to Japan to perform with the Saito Kinen Orchestra under the baton of Seiji Ozawa. In 2005, and 2007 -2014, Ms. Williams has performed with the World Orchestra for Peace with concerts in London, Berlin, Moscow, Beijing, Rotterdam, Brussels, Budapest, Jerusalem, Salzburg, Krakow, Stockholm, Abu Dhabi, New York City and Chicago conducted by Valerie Gergiev. Ms. Williams has performed as solo horn with Dallas Symphony and fall of 2015, she toured with the Cleveland Orchestra as guest principal horn.